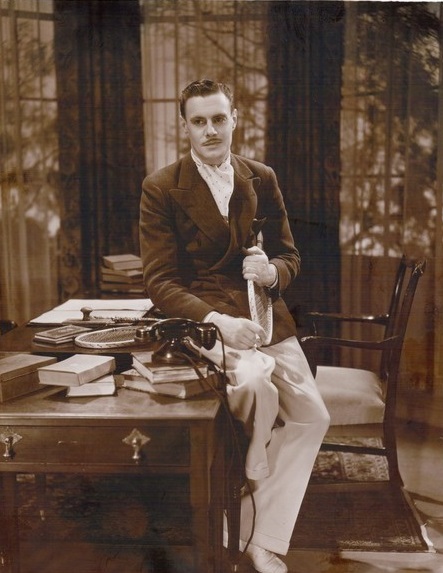 Released in 1933, Christopher Strong teeters between two worlds, with one strappy stiletto planted in Pre-Code and one prim pump parked on the threshold of the Hays Office. If you’ve already guessed that these two rare specimens will figure in the film’s romance, step right up and claim a coupe. And if that’s not setting the stage for a marriage to unravel, I don’t know what is. 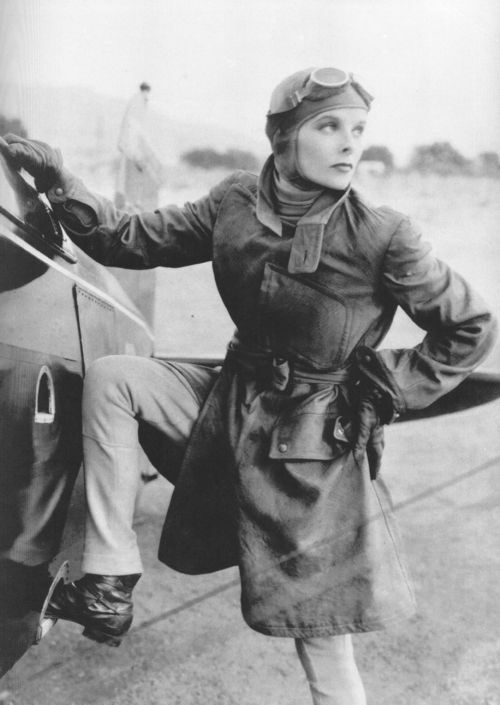 Meanwhile, Monica’s married lover, Harry Rawlinson (Ralph Forbes), makes off with a motorbike and literally runs into Lady Cynthia Darrington (Katharine Hepburn), a daring aviatrix à la Amelia Earhart (though her character was modeled after Britain’s Amy Johnson), who’s been far too busy chasing flying records to focus on romance. After Chris is dragged off to his sister’s party, he tells the jaded young guests, “I believe that devotion to one’s country, one’s home and one woman is the very root of man’s happiness in life.” The only one who doesn’t all but yawn in his face is the other new arrival, Cynthia. Chris encourages the disciplined young flier to befriend his flighty daughter—and in the process, he grows close to her himself. Which worries Elaine, though not nearly enough. She pretty much hurls her husband at Cynthia like Nolan Ryan throwing a fastball. Cynthia, meanwhile, is fighting off her growing affection for the very-much-married member of the House of Lords. But later at a ball, as they dance to the most ominous-sounding waltz ever composed (thanks, Max Steiner! ), they slowly succumb to the inevitable, much as one might finally give in to a bad cold. 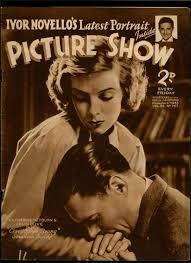 Because honestly, this is one of the most utterly joyless illicit affairs ever captured on film. At times, you can practically hear the Production Code rumbling into the station. At first, Cynthia is an independent spirit, who insists on continuing to fly even (gasp!) after she falls in love. But as soon as she’s bedded, she’s tamed. During her first night with Chris, she gazes at a gift he’s given her: “I love my beautiful bracelet,” she sighs. “And I’ve never cared a button for jewels before. Now I’m shackled.” Not a minute later, he asks her to give up flying, and she placidly agrees. You half-expect her to burst into a chorus of I Enjoy Being a Girl. When Chris isn’t casually breaking his lover’s spirit, he’s agonizing over what he’s doing to his wife. And Cynthia’s right there with him, bemoaning the fact that they’re both so damn decent they can’t even enjoy themselves. I’ll spare you the ending, except to say that one of them pays an extremely high price for the affair. Go ahead, guess. Meanwhile, the adulterous Monica and Harry are having all kinds of fun, with only a brief break for decorum’s sake, to keep Elaine from making for the fainting couch. They’re even rewarded with a happy ending; such is the schizoid nature of this film. 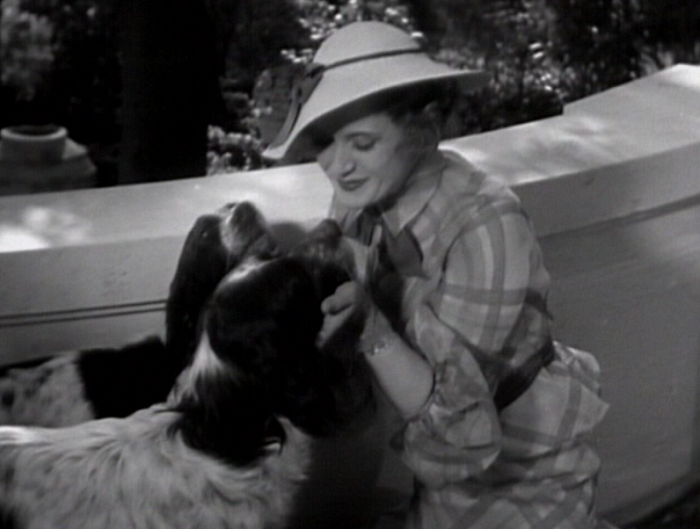 Instead, the real revelation here is Arzner’s close friend Billie Burke, who must have been relieved not to be playing another ditzy socialite, however brilliant she was at it. After Elaine watches from the window as Chris and Cynthia kiss, she sort of wobbles and staggers toward the bed, as if she’s been kicked in the stomach and can barely breathe, let alone stand upright. And later on, when she tells her husband she’ll do anything to make him happy, she lays herself so wide open she breaks your heart. Christopher Strong is not all it could have been, had Arzner and screenwriter Zoë Akins reveled in Hollywood’s last year of freedom instead of voluntarily strapping on the straitjacket. But it’s worth watching. 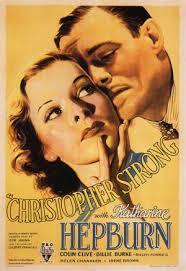 And it marked the first of two pairings for Clive and Hepburn: the second was the ill-fated Broadway production of The Lake, where Dorothy Parker famously quipped that Hepburn “runs the gamut of emotions from A to B.” Clive gallantly came to his co-star’s defense and, although fragile himself, propped up her morale for the brief run of the play. Reason Number 44,009 why I love Colin Clive. Great choice and great post. I was fascinated that Arzner said she viewed the film through Christopher, that she saw him as the protagonist who suffers most or words to that effect. The comment is interesting on lesbian grounds, but also because I don’t find him sympathetic. I don’t like Burke’s quivering self-effacement either. 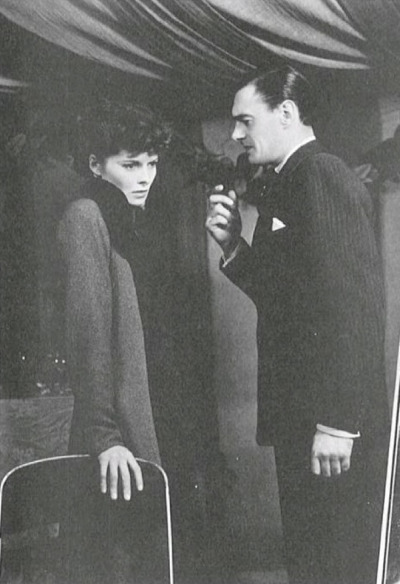 So it’s Hepburn’s loss of her life beyond romance that pains me. Everyone around her is enmeshed in domesticity and its failures. I wanted her to fly away alone into the sunset and shed the moth costume (and its implications of being drawn by light it cannot conquer) forever. Yes, I absolutely HATED the ending… and would love to have seen her leave her lover in the dust!! Terrific review and beautiful photos. I’m still smiling at your description of Irene Browne’s accent! Great writing. Good to hear Billie Burke gets out of her type casting straitjacket. Thank you so much — you’re very kind!! And yes, this is one of Billie’s best roles. She really gets to break free of that caricature!! I’ve never see this movie. Now I want to. So happy to see you wrote about this as I’ve been working on a post about it for the past 3 weeks. It’s taken so long to write because I can’t decide how I feel! 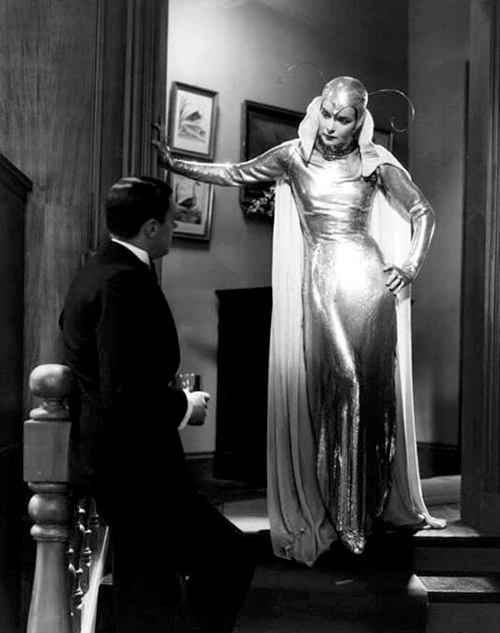 But I must admit, I hadn’t considered it from a pre-code viewpoint, that makes a lot of sense. Part of me also wonders it Arzner – a woman in a man’s world – was already breaking quite a few boundaries, so she had to stick to convention when it came to the ending. Yes, ironically, being a groundbreaker sometimes meant she had to be more conventional!! 🙂 Thank you for sharing your thoughts on this odd little number!! I greatly enjoyed your informative (chiffon velvet!) and imaginative post, Janet! I’m glad you selected this film to write about — I’ve had it in my collection for at least 20 years and, for some reason, have never watched it. I plan to give it a try now that I’ve read your post. Thanks so much for this great contribution to the blogathon! Thank you so much for your kind words, Karen!! And please let me know what you thought of it when you watch it!! 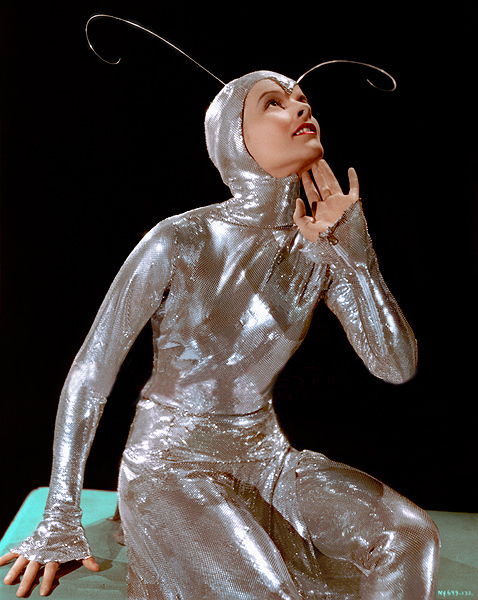 I have to say Hepburn’s moth dress steals the entire movie for me. (Lined with velvet?! No way!!) I never remember the plot – and honestly, I don’t really care – because I’m waiting for The Dress to make an appearance. Thanks for including some info on it. How ironic that you should blog about this – I just saw it for the first time last week. I pretty agree with everything you said, including the ending, and how Arzner could have given things a bit more oomph. And that moth dress! Ah! Chihuahua! I’d seen photos of it before but when she makes her entrance in it, it’s still a knockout moment…and THEN we learn it was lined in velvet. Worth the price of admission alone! Yes, it’s quite the confection!! I wish to heavens it was still around, but for some reason, although Kate kept lots of her Plunkett dresses, she didn’t keep this one… Why, oh why?! ?